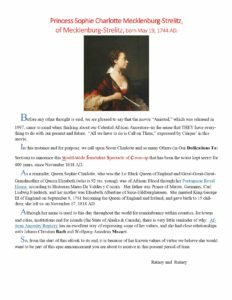 Besides Queen Charlotte reminding the world that she was Queen of England during the 18th Century and her assisting us in this announcement, this major expose' of facts, that occurred 400 years ago, undermines the integrity of our knowledge about the truth of American History (The Virginia Colony). Leaning on the strength of our "Proclamation for You" issued on June 1, 2018 (which is summarized below) and without certification or validation from U.S. History Professional/Institutions, WE CERTIFY the forthcoming statements as FACTS that occurred for anyone (especially the younger generations) to use HENCEFORTH because they are hard facts from the Virginia Colonial Records (Court and the Virginia Company of London). 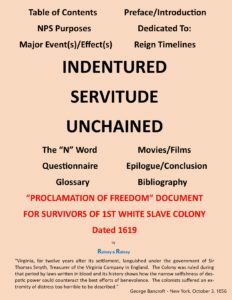 Was the Indentured Servant in America during the Colonial Period fulfilling a labor contract, or was He/She a Slave, or both? Was the 1st English Colony, Virginia, for the 1st 12-years (1607 to 1619 AD) a slave colony? If this was a slave colony, were there Survivors?–how were they freed and was there a Proclamation of Freedom Document issued? Was there an Underground Railroad for White Slavery for over 250 years in America until President Lincoln issued the Emancipation Proclamation in 1863 for White and Black Slaves? 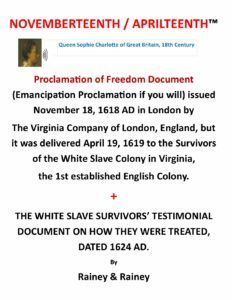 WE are REVEALING THE ONLY “PROCLAMATION OF FREEDOM” DOCUMENT (Emancipation Proclamation if you will) FOR WHITE SURVIVORS OF THE 1st ESTABLISHED WHITE SLAVE COLONY (IN VIRGINIA) THAT WAS OFFICIALLY ISSUED IN 1618 AD AND DELIVERED IN 1619 AD. AND NOW, 400 YEARS LATER WITH TENS OF MILLIONS OF WHITE DESCENDANTS (OUR WHITE BROTHERS & SISTERS AND FELLOW AMERICANS), WITH US ALL CO-EXISTING AFFORDS US: 1) TO HAVE THAT CONVERSATION ABOUT REVEALING THIS NOTED TRUTH AND 2) TO HELP HEAL RACISM, WHAT WE CONSIDER A MENTAL ILLNESS IN AMERICA, AND FOR THAT MATTER, GLOBALLY. THESE TRUTHS WILL HELP TO DISPEL THE MYTH THAT SLAVERY IN AMERICA ESPOUSED ITSELF ONLY upon AFRICANS, but contained within this Cultural App is evidence that WHITE SLAVERY IN AMERICA SECURED ITSELF, THOUGH UNDERGROUND, FOR OVER 250 YEARS THAT COMMENCED IN 1607 AD -- UP UNTIL 1863 WHEN PRESIDENT LINCOLN ISSUED THE "EMANCIPATION PROCLAMATION" TO ABOLISH SLAVERY FOR WHITES & BLACKS ...HENCE WHAT SHORTLY FOLLOWED IN 1865 WAS THE 13TH AMENDMENT OF THE U.S. CONSTITUTION THAT LEGALLY ABOLISHED SLAVERY AND INVOLUNTARY SERVITUDE FOR THOSE WHO HELD SUCH STATUS. We are pleased to receive your comments relative to our work(s) in the community, and we trust you in turn are also spreading the truth about us all being each other’s keeper.